Flamingo Hill Camp offers its guests the finest in accommodation. En-suite with private shower and WC facilities, the tents are spacious and provide the traveler with the utmost in terms of comfort. 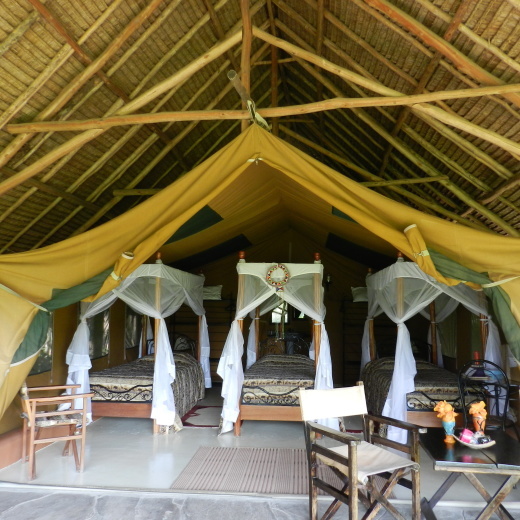 All tents come equipped with mosquito nets, and a private verandah overlooking the African landscape. Guests are often treated to the resident buffalo and other wild animals that come to the watering hole. What better way to end your day then to sip your cocktail and watch the African sunset all from the comfort of your verandah! 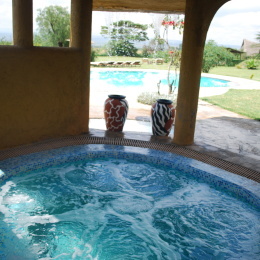 Flamingo Hill Camp is situated within the famous Lake Nakuru National Park, which lies within the Great Rift Valley of Kenya. The camp is an eco-friendly establishment. Part of the money earned from the camp is used for environmental restoration and endangered species. Cosy, warm and inviting with a personal touch, Flamingo Hill Camp offers the traveller a home away from home! Small and exclusive, Flamingo Hill Camp comprise 25 tents. The tents are furnished with the understated luxury required by the modern traveller. Decorated in calming safari tones, natural woods, wrought iron and crisp cottons, each tent has been meticulously planned to maximise comfort. All tents have four poster beds and mosquito nets, en-suite shower, WC and flush toilets, a writing desk, a private veranda overlooking the plains, voltage at 240 volts, hot and cold running water. The restaurant seats approximately 80 people comfortably and serves a buffet breakfast and lunch. Dinner is a mix of table d’ hote or buffet style. The camp's experienced chefs will prepare meals to tantalise taste buds! Flamingo Hill Camp also caters for any special dietary requests made by guests. The bar is well stocked with local as well as imported beverages. All guests are treated to the famous flamingo hill cocktails whilst relaxing in the comfortable and open lounge with a view of the plains. Watch the spectacular display of the sun going down over the lake as you enjoy a sundowner with bitings especially prepared for guests.